Today is the final day of GIANT Health Event, where DigitalHealth.London has been leading a fantastic three days packed full of NHS, industry and research speakers aimed at helping tech innovators to work with the NHS. 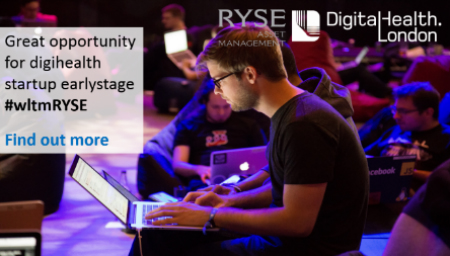 They have also just launched an exciting new partnership with RYSE Asset Management and are looking for digital health start-ups that could benefit from their expertise and funding. Read further down for more information. A lot has been happening politically this month too, with the vote for the European Medicines Agency to relocate to Amsterdam; the Budget announcement; and the Government’s Industrial Strategy which launched on Monday. It’s fantastic news that MSD is set to open a research facility in London, which could support up to 950 jobs, and the Government has shown its commitment to life sciences with a boost for R&D spending and funding to speed up the delivery of the Cambridge South railway station. Adaptimmune Therapeutics plc, a leader in T Cell therapy for cancers, also officially opened their HQ in Oxfordshire this month, bringing together their R&D operations and corporate teams at Milton Park. I was on a panel this month looking at open innovation and the importance of geographical clusters at FT’s Annual Global Pharma and Biotech Conference. You can watch the session back here. In December, we’ll be speaking at the Milken Institute’s Annual Summit on transforming healthcare through tech; in Oxford at the Innovation Forum Leaders Conference discussing Diversity and Inclusion; at EIT Health Summit speaking about women entrepreneurs; and we have a breakfast briefing around UK-Japan opportunities at Genesis coming up too. I hope to see you all at an event soon to toast the Christmas season! Each month we will share a Golden Triangle company that is making waves in the life sciences sector. This month we speak with Martin Frost, CEO at Cambridge Medical Robotics, who are developing next-gen robotics for universal minimal access surgery. Great news for our ‘Collaborate to Innovate’ programme this month as one of the projects has had a breakthrough in their ambitious study to provide in-vitro evidence that Leukocyte Infusion therapy (LiFT) works in pancreatic cancer. They will move into human trials later next year. Cambridge Ahead has published a report that explores the current and future landscape of wet lab and incubator space provision for start-up and early-stage life sciences companies in the Cambridge. The Government issued its Industrial Strategy White Paper on Monday, with Life Sciences being one of the key sectors for the economy. We have pulled out the key announcements here. DigitalHealth.London has been commissioned by RYSE Asset Management LLP to support their Early Stage Opportunity Fund. They are looking for digital health SMEs that are developing solutions in a number of areas, including telehealth, mhealth and health analytics. What does the Autumn Budget mean for Life Sciences? This year’s Budget had some good news for life sciences in the region, with investment for a Cambridge South train station, more funding for R&D and a plan to unlock patient capital investment. Read on for the pull-out points for life sciences. MedCity is hosting a breakfast briefing on UK-Japan Life Sciences opportunities at One Nucleus’ annual event – Genesis – on 14 December. Join us and Imperial College London, AMED, Life Science Innovation Network Japan and Imanova from 8am for insights into the two markets. A joint venture between the NHS and regional business partners has awarded £80,000 to £125,000 to four medtech innovations: a safer injection system for regional anaesthesia, vacuum therapy for leaks in the upper gastrointestinal (UGI) tract, a non-invasive sleep apnoea diagnostic device, and a pioneering technology to improve the efficacy of tissue ablation, used to destroy tumours. Sign up for Cohort 3 of the DH.L Accelerator! Are you a health tech company looking for opportunities to connect with NHS stakeholders, industry investors, patients, and other healthtech innovators. Register your interest for Cohort 3 of DigitalHealth.London’s Accelerator. A King’s Health Partners collaboration with British technology company, Buddi Nujjer, has been selected as one of five companies to test digital technologies in the fight against type 2 diabetes, as part of the NHS’s Digital Diabetes Prevention Programme. Launched in April 2014, MedCity is a collaboration between the Mayor of London, Imperial College Academic Health Science Centre, King’s Health Partners, UCL Partners, Cambridge University Health Partners and Oxford Academic Health Science Centre. The next edition of MedCity Update will be sent in December 2017. ©2017 MedCity. All rights reserved.